"I’ve come all the way from London to be at this special 15th birthday celebration, because the Foyer Federation holds Bridge Foyer and the other Foyers of Your Housing in high regard. And at a time of great innovation in Foyers in the UK and overseas, represented by programmes such as Open Talent and Healthy Conversations run with Your Housing, I want to try and understand why it is that a beacon Foyer like Bridge could be put in a position where its vital service is under threat through the current commissioning climate. So marks the introduction for a job at Haringey Council as Director of Children’s Services – an authority trying to move on from the legacy of the Baby P scandal to put in place a culture of high aspiration for children and young people. They are using what we call at the Foyer Federation ‘Advantaged Thinking’; to start with what is possible –tomorrow’s leaders - and develop services to ensure that young people can create the possible in their lives. What about Cheshire West and Chester? What vision is being expressed in its strategic commissioning consultation document? If you look at the outcomes, there is no sense that the young people of Chester are being prepared as tomorrow’s leaders, artists and innovators. In Chester, young people are not being equipped to thrive; they are being given an offer of ‘Housing Related Support’ that is only prepared to help them cope. Because all the evidence shows that services, such as Foyers, designed to do more than housing related support, enable young people to navigate a world that is far more complex that the choices suggested in the consultation document. Instead of the Advantaged Thinking approach in Haringey, Cheshire West and Chester start with what is not possible, the suggestion that young people cannot do more than sustain a tenancy, and then they propose commissioning services that ensure people can never achieve anything else. 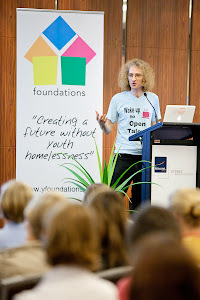 It’s what we call Disadvantaged Thinking – seeing young people in terms of problems instead of possibilities. The difference between Haringey’s job ad, and Cheshire West and Chester’s consultation document, is like the difference between the story of the good and the bad parent. When a child is learning to walk, the good parent holds out the aspiration that the child crawling on the ground and falling down will be able to do something that is beyond their current ability. They encourage the child to keep trying, because they believe that they can and will be able to walk in the world. Compare that to the story of the bad parent - who, when their child falls down trying to walk, says – I’m sorry, but walking is not for you, you are best crawling, and we’ll help you develop the skills to sustain your crawling for the rest of your life through ‘crawling related support’ so you can cope with not having the talent to walk like the rest of the children in town. Why does Cheshire West and Chester only have the vision to offer young people the Housing Related Support options to help them crawl through life, instead of learning how to stand tall to find their talents through talent-building services? Just imagine if the people responsible for the consultation document had been tasked with managing the GB Olympic team. A team of athletes, prevented from breaking any bones, supported to sustain their tenancies and behave in in the Olympic village – but not equipped with the skills and experiences to win any medals at the games. At the Olympics, the GB team succeeded in winning its biggest medal haul through 3 key lessons: giving athletes access to high quality coaching; providing flexible, personalised budgets for athletes to navigate their life needs so they could focus on thriving; and creating a culture of high aspirations that believed in success, instilled confidence, and encouraged peer-to-peer positive support. Where are those ingredients in the Cheshire West and Chester consultation document? In Chester, the service best placed to offer young people access to those 3 things, with the experience of doing so successfully, is now in danger of being axed because it doesn’t fit the strategic commissioning model being proposed. Where is the Olympic legacy in that? The Olympic Games opening ceremony was memorably kicked off by a local Cheshire lad, Daniel Craig, famous for James Bond – a character associated with standing up against those who threaten our freedom. I wouldn’t dream of comparing the intensions of Cheshire West and Chester with those of SPECTRE from the early Bond novels and films, but they do share one thing in common: an attempt to impose a system of control over the world that we know in our hearts is wrong, that we know only benefits a few, and that we know needs someone with the courage and determination to fight against. The logic behind the Cheshire West and Chester consultation amounts to this: that there are some young people who we should only offer a minimal Housing Related Support offer to because they don’t have the talent to invest in their development through a more specialist talent-building service such as a Foyer. They are wrong. The logic is faulty. And the implied intent will leave Chester with a generation of young people with short term tenancy skills but without the longer term investment in their talent to build our collective future. At the Foyer Federation, we are creating a new movement to tell a different story about young people. A story that can challenge disadvantaged thinking with the reality of who young people are, what their authentic voice is, and who they can become. It’s a movement for ‘Taking Advantaged Thinking Action’. And you can be part of that here, in Chester, by becoming an activist and special agent for Bridge Foyer. You can be 001 – and make sure that the language we use about young people is focused on who they are, not the negative stereotypes and deficits that get attached to them by others. You can be 002 – and make sure that the knowledge you have of young people is based on what they can do and aspire to, as we have witnessed in the young people performing today, not just their problems. You can be 003 – and make sure that the way you work with young people is shaped around the power of coaching as opposed to supporting. You can be 004 – and make sure that the future isn’t about the 20% savings the commissioner needs to make through service cuts, but about the 80% that will be wasted in just supporting people to cope instead of equipping them to thrive. You can be 005 – and make sure that you express the highest aspirations for young people as a good parent would. You can be 006 – and make sure that we really involve young people in what we do, enabling their experiences to shape the services they receive in a more genuine way than the processes used in this consultation. And you can be 007 – the ultimate agent - by challenging and campaigning for Taking Advantaged Thinking Action to secure a better world for young people. So respond to the consultation document. Stand by the staff and young people of Bridge Foyer. Think what talent you have to offer to help open young people’s. And whatever happens tomorrow, remember this song, by a music band called the Manic Street Preachers, from 1998 when Bridge Foyer was being built: ‘If you tolerate this, your children will be next’…"